According to the Federal Bureau of Justice Statistics, an alarmingly high number of criminal defendants and/or prison inmates report that they suffer from drug or alcohol addictions. Frequently, these addictions are precisely what led these individuals to engage in criminal activity and enter the criminal justice system. This connection between substance abuse and criminal conduct has led many States to create specialized courts, often referred to as drug courts, to address these cases. Many counties in New Jersey have drug courts. Defendants who can satisfy the eligibility criteria should seek to take advantage of this program. Generally speaking, a drug court is an amalgam of rehabilitation and probation that many States are adopting as an alternative to prison sentences for low-level drug offenders. Drug court targets the cases of non-violent drug or alcohol-addicted defendants. The goal of drug court is to break the cycle of addiction and recidivism among this offender population. Drug court applicants must pass a rigorous screening process, demonstrate that they do not pose a threat to public safety, and that they will benefit from treatment and rehabilitation services. The requirements of drug court are strict because the road to recovery is difficult. Drug court participants receive intensive supervision. Each participant's progress is continually, and closely, monitored. They are required to attend and successfully complete substance abuse treatment programs that were specifically chosen to meet their unique needs. They are tested frequently to see if they are remaining clean, and must make regular court appearances to report to the drug court judge concerning their progress. They can also be required to maintain gainful employment, and/or successfully complete educational or job training programs designed to provide them with skills that they can take with them upon graduation from the program. Non-compliance with drug court requirements can result in sanctions. The hallmark of drug court is that the program's "team" consists of specially trained judges, attorneys, psychiatrists, psychologists, social workers, and other skilled treatment professionals. Thus, participants in the drug court program receive guidance from a range of professionals who have been trained to deal with substance abuse issues, and are therefore particularly sensitive to the facts and circumstances underlying the criminal conduct that brought them into the system. New Jersey established its drug court program approximately 10 years ago. It is considered one of the nation's most comprehensive drug courts. Other states with similar programs often watch - and copy - New Jersey's drug court as part of an ongoing national effort to reduce prison populations and the associated costs. A defendant's stay in drug court will usually last between three and five years. In some cases, this period of time can be longer than the county jail or prison sentence that would be imposed if the defendant's case was disposed of in a conventional criminal court. Further, because of the program's demands, drug court can be more difficult that a jail or prison sentence. What defendants who are eligible for drug court need to remember is that jail time is almost certainly a waste of time. The jail or prison experience will do nothing to assist the defendant in overcoming the drug or alcohol addiction that caused them to become enmeshed in the criminal justice system, whereas drug court is designed to do just that. Successful drug court graduates put their addictions behind them, and move on from the drug court experience to become positive and productive citizens. 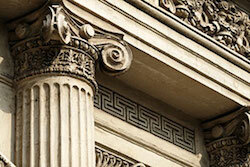 James S. Friedman, LLC, assists eligible defendants in gaining admission to New Jersey drug courts. If you have a criminal charge that resulted from a substance abuse problem, contact the firm online or call toll free at 800-361-6554 to learn more about the drug court program and whether you may be eligible.